Überzone ‎– Space Kadet E.P. All tracks manufactured by Q. 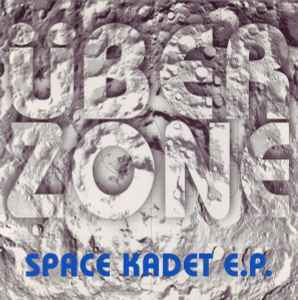 The space breaks of Uberzone's big introduction to the techno world, the SPACE KADET EP, come crisp and furious, with plenty of retro pleasure, from the fresh beats and electro twists of "The Brain (Braindusted)" to the acid breaks of "Moondusted,' which get shot further into outer space with "Botz (Synthetik)," though it keeps its feet firmly on the dancefloor. "Moondust" finds its way into a more steady 4/4, and "Botz (Elektro)" goes for the bottom-heavy approach. "Dream Sequence" ends the album on a brisk, house note. A solid intro.